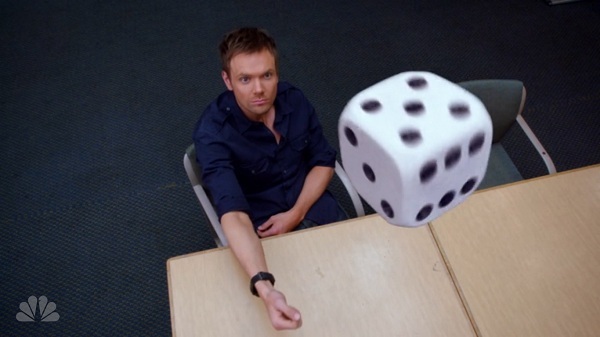 When I wrote about “History 101” in February, I started my review of Community Season 4’s first episode with this: “It wasn’t as bad as I’d feared, but it wasn’t as good as I’d hoped.” I was referring to the fearful expectations for the first installment of Community post-Dan Harmon, the show’s brilliant but reportedly-difficult showrunner who was fired off the show last year. By the end of the season, it was just about as bad as I’d feared. There’s no better way to ruin your best episode than by beating it to death in subsequent episodes. As Season 4 went on, it seemed to get worse and worse. There were a few bright spots (most notably “Basic Human Anatomy,” which was tellingly written by Dean Pelton’s Jim Rash, not a regular member of the writing staff), but the show as a whole was a slog, with extra mud and junk piling up toward the end of the journey. It all came to a head on Thursday with “Advanced Introduction to Finality,” probably the worst episode the show has ever done (rivaled only by the previous week’s “Heroic Origins”). In it, Community’s writing staff demonstrated everything the show has done wrong this year in microcosm, heaping hacky reference upon stilted joke until the whole thing crumbled into a distasteful mess. It’s enough to make you wish that the “new” version of the show won’t be back, but NBC announced this weekend that #sixseasonsandamovie will get one season closer next season. I may have to sit it out. 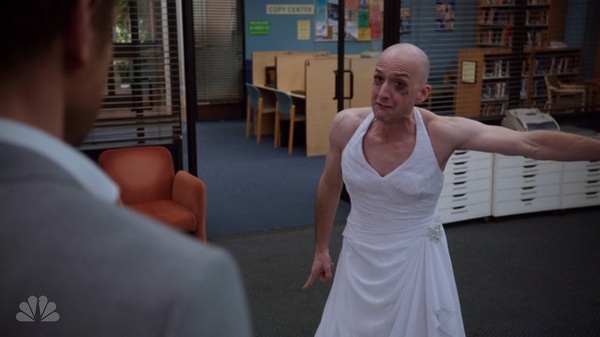 I love Dean Pelton and his costumes, but this had to be the 80th time we’ve seen him in a dress this year. Of course, it would be disingenuous to suggest that “old” Community was not a show that was completely obsessed with itself. The difference lies in the execution. In seasons 2 and 3, Harmon examined himself, Community and television at large relentlessly, but he did so in the form of self-criticism, metatextual commentary and intensive study of character dynamics (he and his staff also wrote very funny jokes, something that cannot be said of this year’s efforts). No, Abed. No you did not. I understand that it’s hard to transition between showrunners, particularly when the person you’re replacing is revered at an almost cult-like level. But in trying to please as many current fans as they could, the current writing staff didn’t break any new ground or really even tell any good jokes. Ironically, Community felt least like Community when it was trying its hardest to act like itself. If this is what it’s going to take to get to six seasons and a movie, I would have preferred three seasons and out.